The first few minutes of this aren't promising. The introductory bars of the Mendelssohn sound mushy, as if Haitink were unsure of Perlman's preferred tempo. The soloist's entry establishes a firm pulse, but his piano tone is strangely "thready" and lacking in fullness. A bit later, Haitink seems to have trouble catching the orchestral entry on the way out of the cadenza. The movement "works" musically but the collaboration starts to feel like a mismatch. Fortunately, this turns out not to be true. 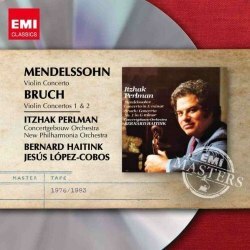 Perlman's playing of both the Bruch G minor and the Mendelssohn blossoms, doing justice both to the flashy virtuoso moments and the introspective pages. Haitink, too, eventually settles down to serve up full-bodied orchestral backings: the fast-moving finales particularly benefit from his way of giving every note, no matter how short, its full tonal value, all within clear, organized textures. With these artists, the fervent central Adagio of the Bruch G minor really becomes the emotional heart of the piece, as commentators are apt to describe it. I suspect, however, that it's Bruch's D minor concerto, plucked from an earlier analog release, that will interest most collectors. Perlman doesn't entirely banish the score's occasional whiff of "sequelitis". The violin's patterns in sixths sound vaguely familiar, as do the extended lyrical meditations. However his phrasing is expressive and aristocratic. Note the purity and repose with which he invests the first movement's cantabile theme at 3:17 and 8:57, or the vaulting leap and dazzling arpeggio at 0:45 of the central Recitative movement. López-Cobos's conception of orchestral sound and ability to enforce ensemble are more generalized than Haitink's, but his accompaniments are characterful: the passage at 7:30 of the first movement, for example, blossoms expansively. When this musicianly performance was, briefly, the only game in town, one could buy it with confidence. Since then other, tidier renditions have appeared. Salvatore Accardo (Philips) brings soaring tone and spot-on intonation to all three Bruch concertos, and Masur backs him with well-manicured Gewandhaus accompaniments; the Philips Duo "twofer" is worth hunting down. If you just want the D minor, Maxim Fedotov's impassioned account (Naxos), with polished, dramatic orchestral support, will do nicely at bargain price.